Cheaper Fares or Better Services? This will support an expansion in public transport networks. What if Govt policy said to Councils please maximise shift from single-occupant cars to public transport/walking & cycling…you reduce PT fares and increase services to drive the shift and we’ll support by increasing subsidies? If you want transit to be mainly for low-income people who have a low value of time, cut fares, as this is an improvement targeted to benefit only the cost-sensitive. By not improving service, this choice may also lead to an increased “stigma” around transit as it is perceived, with increasing accuracy, as a low-quality experience that is of no relevance to people who have choices. Improving services should definitely be the first focus for any extra money the government wants to invest into public transport operations. The much promised “new network” is already compromised by pathetic weekend rail frequencies and funding shortfalls that mean routes initially promised to be run as “frequents” (operating at least every 15 minutes, 7am-7pm every day) won’t meet that definition. Once the core of the new network is in place, AT need to work towards having more frequent routes, and having more frequent frequent routes. By that I mean we need a larger number of frequent routes and we should be aiming to improve the minimum frequency from every 15 minutes to every 10. In recent years we have introduced zone-based fares, which I has made us a little more competitive with other cities and has brought the cost of “cross-town” trips down considerably. As an example, if you avoid the city you can now travel from Pt Chevalier to St Heliers for under $2 on a Hop Card because it’s all in the same zone, whereas a few years ago this trip would have set you back at least three times this cost. some people travelling during off-peak periods, such as visitors, are not price-sensitive. Bulk discounts — Pre-purchased annual passes in places like Switzerland are extremely popular, and help people/companies minimise transaction costs and qualify for a discount by committing to PT in advance. Even with monthly passes, which AT have been trying to price people off, I’ve noticed a big difference in my usage and perception of PT when I have one compared to when I don’t i.e. I’m more inclined to want to use PT if I have a pass. Having good pass options could also become a real alternative to a company car or parking space (as long as fringe benefit tax anomalies were worked through). Concessions — It seems like are some inconsistencies in how we provide concessions, with current concessions mainly focusing on age and whether you’re studying. In particular, there is currently no concession for those on welfare. It certainly seems odd that wealthy pensioners can get free public transport to wine and dine on Waiheke Island, whereas struggling parents rushing between jobs in South Auckland have to pay full fares. Over the next few years, as we build City Rail Link, Light-Rail and a number of key busway corridors, I think our public transport system will come under huge pressure as demand continues to grow but the system’s capacity is still in the process of being expanded. There may well be a strong case for encouraging more people to “time shift” out of the peaks, and providing an off-peak discount could be a useful incentive for this – even as a short-term measure. So perhaps the answer is “a bit of both”. Mainly focus on improving services and growing the frequent PT network, but also look to apply targeted fare discounts – particularly if this helps to “smooth demand” and avoid severe overcrowding. Having a small city centre zone already does that to some extent. Not for people who live in town itself, but for most other suburbs. For example you can travel from Newmarket to New Lynn, Otahuhu or Panmure for the same price as Newmarket to Britomart. If people have the flexibility to time shift, surely the massive increase in peak congestion means they’d be doing it already. Most people don’t have that option; you show up when you’re told and work business hours. Lather, rinse, repeat. I agree with your comments – some sort of the mix of both sounds right. I have just come back from china and PT with high frequency was really useful and easy to use. I would support more weekend frequencies between 7 am to 7 pm. Plus extending the peak frequencies to 7 or 8 pm weekdays. Plus a happy hour fare between 6 to 8 pm at 30% discount. It would help to move the peak PT usage. You might have to extend the morning peak time to 10 am. Then people with Flexi could use it. Plus if retailers where smart they could open there doors say at 10 and close at 8 pm or something. Then office workers could shop after work ( how much business do shops really get before 10 am ?). I have heard that the nurses would like a later train to meet there shifts. This makes sense to me as I am sure there are other users that would use the train as well (cleaners, people having the occasional late night out). The last train could have a 50% discount as well to increase its popularity. +1 I think it is high time that NZ retailers (especially malls) follow what most do overseas and move to 10-6 (or even later like 10-8) trading hours (at least in Auckland). Would reduce peak morning pressure and also help in the evening. The retailers association tried that a couple years ago in the city centre, aiming for 10am to 7pm opening for retail. It was shouted down by the unions making arguments about shopkeepers having to get home to cook dinner for their kids. To be honest I’m not sure if that reflects the reality of retail staff in the City Centre, and it might be something of an own goal effectively forcing retail staff to commute 9-5 with the worst of rush hour. They need flexible shifts, the staff who don’t need to cook food, such as students can fill that shift. It also creates job opportunities for them. The union always enforce one size fits all and restrict invididual choices. Yes, as long as every job is paid an Auckland-adjusted living wage rate, with extra money for any split shifts or insecurities. There are 40,000 students in the city centre each day, I’m sure most of them would be happy to do evening shifts in retail after classes. no need for split shifts…. Example: If a shop is open normal hours 9-5:30pm (8.5 hours) and has 6 staff. Then compare to a shop that is open 10-7pm then that is 9 hours. Say there are 6 staff working in it. At 10am you have 3 staff working, at 11am you have all 6 staff working then at 6pm you are back to 3 staff. Same amount of work done (so not costing businesses extra). The first and last hour are going to be the quietest, however the busiest time over lunch and 4-6pm is when you will have all 6 staff working. By utilizing the shop more it might also mean that company might not need to build an extra store somewhere else to cope with the demand. The First Union campaigns against all changes in shop hours, regardless of whether the workers are members or not. This is one of their principles. And since one does a principle of a pretty small union affect businesses where this union is not even there? I used to work in the CBD, I was part of a union ( e tu) working in a 24h 7/7 365 business. Stop the crap. I think you are overlooking the purpose of the Gold Card when commenting about “wining and dining on Waiheke”. The purpose is to encourage older people to get out and about, mingling and interacting with others rather than staying indoors and suffering from loneliness and isolation. One of the comments from Waiheke businesses is that the pensioners visiting the island bring their own cut lunch and do not “wine and dine” very much. Coming here from London as I did many years ago, car ownership was forced on us because of the poor or non-existent public transport whereas in London PT was regarded as the normal means of travel and car ownership was unusual. Despite owning a car, I find PT now to be excellent and fascinating – improving services are wonderful but could do with even more improvement. To talk about the “stigma” of PT is counter-productive, especially in view of the magnificent new trains and buses now in operation. However the comment about the discrepancy between what is offered to the different demographics is spot on. It is utterly inequitable. To encourage more marginal trips, fare caps also need to be considered. These could also have some off-peak element. In addition, they would also benefit those taking several short trips, for example stay-at-home parents. That would shift the focus away from the commuter to the general user. Doesn’t have to be a cap. Could also be an additional discount that applies after a certain value/journeys. E.g. in brisbane you pay full price for first 8 journeys and then get a 50% discount on all subsequent journeys. I couldn’t agree more. What’s the point of 10 (or better) frequency when the bus takes 1h to travel 10km? 1. free or 50c flat fare irrespective of distance for children and school students. This would take a good portion of cars off the roads in the problematic morning peak. The additional upside is that by investing in youth you are changing the long term perception and experience of PT for the next generation onwards. 2. Pre-peak discount e.g. 25-50% off for before 7am/7.30am. The worked very well in Australia and shifted a good portion of people to earlier services and freed up capacity. This could be a good option ahead of CRL as patronage growth will be a challenge. Also agree that providing a discount for people of social support would be preferable than unnecessarily wasting money by discounting for everyone. Better to use this for increasing services. If this is targeted then I would think the Govt and AT would be striking the right balance. I think that Jarrett Walker over-simplifies in his comments. When HOV/toll lanes were introduced in LA they characterised as “Lexus lanes”, suggesting that the wealthy would pay for a quicker trip. However the lanes were also heavily used by low income workers with multiple jobs and had to get from one job to the next quickly, so were prepared to pay more. Better service benefits everyone, especially where new routes and travel opportunities are the result. Lower fares only benefit those whose travel patterns fit the current opportunities. This is Jarret’s exact point. We shouldn’t assume that low income people have plenty of spare time. Discounts are cumulative, for example my peak fare is $4.94 and off peak after 8 journey price is $1.72. I particularly like the Sunday scheme as it encourages families to get out and leave the car at home. Sounds good all of those. Cheaper Fares or Better Service? Yes Please. Both. We have to afford both. Transport carbon emissions are out of control, and need to be reduced heavily. Pollution of our waterways is dire, and needs to be cleaned up through radical reduction in private vehicle use. Lack of access to our city due to sprawl is limiting opportunities and reducing social health for a growing sector of the population. That’s unacceptable. I’m not choosing between them, because choosing between them is really just saying that we’re prepared to not go far enough and we’re prepared to put the costs onto our young people and future generations. I’m not prepared to do that. How does one “pre-purchase” something? Buy it before I buy it? Agreed need somekind of off peak pricing incentive as well as improving off peak frequency. A lot of mums and kids can use off peak PT if they are priced competitively to driving and have frequent fast service. How good would it be if kids 0-18 travelled free (0-10 require a guardian)? It would be brilliant in pushing the next generation into realising public transport is viable. Plus it would take tons of cars off the roads. +1 Maybe the trucks could pay fairly for their use of the roads and the revenue could be put into free children’s fares. Only thing I’d add is children can and do travel without guardians all around the world. The under-10 age group isn’t the one you’d expect to be making ‘unnecessary’ trips. So I’d make it just free for all children. Otherwise the kids whose parents aren’t available to be taxi-driver would continue to miss out. Both please. Good example of the recently increased service (twice as frequent) of the 380 Airporter route picking up patronage of around 30%. Continued Subsidy for Carbon Use, Environmental Degradation, Social Deprivation and Poor Urban Form. 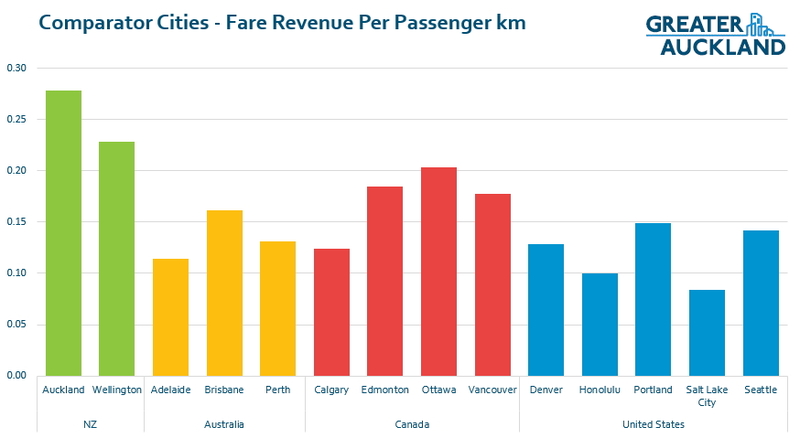 I think cheap fares are THE only thing that gives PT an advantage over the private car, in general terms. Obviously PT peak travel is better in some cases but overall PT has few other advantages. Until rapid PT is introduced, and I would count Onehunga to Britomart rail as something verging on that, attractive fares are where it is at. Since we are bus based, largely, PT is very very slow and as I have read in comments in other posts, at some point few of us have the hours in the day to conform to the basic service provided that move at a slow pace and so go back to our own vehicles. As for your comment “there is currently no concession for those on welfare. It certainly seems odd that wealthy pensioners can get free public transport to wine and dine on Waiheke Island”, God, ain’t that is the truth. We have to get over petty punitive hatred of those who have to rely on benefits or are poor. The already comfortable getting free travel for jolly’s in retirement “Because they’ve earned it” entitlement crap, whilst the poor with children struggle is one of the great Kiwi pastimes of punishment for those not so well off. That attitude needs to change asap!. Definitely agree that a low-income concession is needed. Anecdotally the $10 upfront cost of a Hop card is also a barrier for some people, so we need a mechanism to distribute them free or at a lower cost – WINZ offices, or mail them out with community services cards? Central government should fund “true public transport” for social reasons. A 24/7 service with maximum 30 min headways and synchronized transfers where possible. The network would be a time varying mix of fixed route and on-demand services feeding to/from the fixed network. Any service level improvements above that should be funded by local government and fares. I need to add “full coverage network” for central government. In addition to the regional fuel tax I would have say an additional $75 per household transport levy which to be palatable to the ratepayer gives free PT to all on weekends.This would encourage people like myself to use weekend PT rather than the car as you have paid for it in your rates and the trains /buses are not exactly full on the weekends at the moment. This could also help fund off peak weekday fares say half that of peak. I assume the cost of running of a scheduled train/ bus is very similar whether the train/ bus is full or empty. When I lived in Tokyo, Japan, in 1994, in addition to my monthly salary I was given a PT card, which allowed me to enter or exit the train system at the station nearest my home or the one nearest my workplace – so basically a commuter card only good between home and work. (There were various cheats to get more use out of the card, but I understand the rail companies got wise and shut them down). The ridership goals that are set for PT will determine the approach taken. If the aim is to, say, double ridership in five years then radical change will be required. AT’s figures show that the current annual ridership growth of around 7% is resulting in increased fuel usage and therefore logically more congestion and fuel emissions. As congestion increases there appears to be a strong temptation by central govt, NZTA and AT to think that they need to fix it by adding more roads, extra lanes, by passes etc. With scarce resources every dollar spent on roading is at the expense of public transport. With AT so far behind near targets (2020) for fuel usage and greenhouse emissions only radical change will enable AT to even start to approach those targets. Every year ground has been lost. It is an indictment on AT that despite going backwards AT have done nothing to reverse this; or if they have done something it has been unsuccessful. If Auckland is to have ambitious targets then simply the provision of more and better services is unlikely to drive sufficient growth. Cheaper PT seems to be necessary. I don’t believe that the answer is just cheaper fares for poor people. That’s not going to fix the problem of congestion and emissions; and if the problem is poverty that’s what the welfare system is for. There is also the fundamental issue that the people paying for PT subsidies are likely to be more affluent and so it seems reasonable that they be able to share in the services they have paid for. Historically the govt has provided services for rich and poor alike: hospitals, education, policing and transport seems no different. The transfer from cars to PT of a huge sector of our population will produce such overall innumerable benefits such as I have discussed above that I don’t believe that we should try and pick winners to ride our PT system. I have often quoted the world’s most liveable city, Austria, where only 27% of journeys are made by car. I have copied the following piece about Singapore’s introduction of congestion pricing. This may also be an option to drive PT usage. According to the book The Journey – Singapore’s Land Transport Story, the amount of traffic entering the Restricted Zone in June 1975 (before the ALS was introduced) was 32,500 vehicles, and after the beginning of the ALS in June 1975, the vehicle numbers dropped to only 7,700, between the hours of 7.30 am to 9.30 am, a 76% reduction; and 9% of the users switched to transit. The use of transit for work related trips into the RZ “sharply increased from 33% before the ALS to about 70% by 1983”. In 1994 ALS was extended to a full day, resulting in an immediate 9.3% drop in traffic in and out the RZ. The most important thing is that AT start to do something. Lester Levy’s rhetoric is great, but it won’t put people on trains and buses.There is low hanging fruit such as Heidi has mentioned where parking strategies are not applied correctly and bus lanes that are not built in the time frame that they have been timetabled. That should be a starting point. 75 people on the platform at Britomart with 17 minutes still to wait for the 6.40pm Western line service on ANZAC day. How long until those nitwits at AT work out that PT isn’t just a commuter service?